Miniaturization has led to an increase in the use of micromachining processes. The need for the material processing at microatomic resolution at an economical cost has underpinned this technology in many industries. Laser micromachining is a precise noncontact type of machining process which is used in the fabrication of micro-components ranging up to 500 µm. Laser ablation distinctively focuses on the small elemental areas which helps to absorb a high percentage of energy. This chapter represents an overview of various researches carried out in laser machining fields, its applicability and the advancements made. It also shows the implementation of ultrashort and femtosecond pulsed laser micromachining. Laser micromachining has lot of advantages over conventional contact machining processes as for instance the machining of any workpiece material can be easily accomplished within predefined time. Femtosecond laser machining can machine even transparent materials like glass, sapphire. 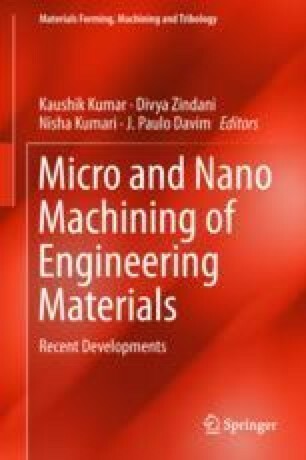 The analysis of various theoretical and experimental research is used to describe the performance of laser beam micromachining (LBMM) on some of the advanced engineering materials.